Mission Beach is a Queensland coastal destination that is known for its close proximity to the Great Barrier Reef, stunning tropical rainforest and some of the east coast's best beaches. An ideal destination to take part in holiday activities like snorkelling, diving, bushwalking, shopping and exploring, Mission Beach is a must-see for any tourist seeking the best of Australia's beaches. One of the most popular attractions in these parts is the well known, Dunk Island. From South Mission Beach, water taxis and launches operate daily from Clump Point to the Island, which is situated 20 minutes off the mainland. Dunk Island is a rainforest island paradise located within the Great Barrier Reef and is a must-see while in the area. Considered the unofficial capital of North Queensland, Townsville is a lovely Australian city that boasts some of the state's most intriguing attractions. Another fantastic aspect of the city is its ability to retain its elegant Victorian architecture. In the suburbs you will find fine examples of the Queenslander style houses that were built with timber and boast wide verandas. 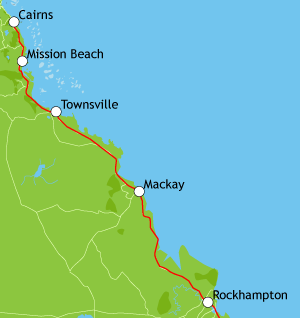 Mackay is a Queensland city surrounded by lush green cane fields and bisected by the broad Pioneer River. The best way to discover what it has to offer is to take a stroll along the Heritage Walk, which will introduce you to several National Trust structures. It is also worth crossing the river to explore the city's northern section, the stunning harbour, the multi-million-dollar marina development and white sand Harbour Beach. Other popular options include taking a cruise to Brampton Island or the Whitsunday Islands, and the scuba-diving spots off Credlin Reef. It sounds like a lot, but it is true that Mackay is home to some 31 beaches. Take some time to discover at least a few of them and either relax by the calming waters, take a dip, try your luck at surfing or simply work on your tan. Nestled on the banks of the Fitzroy River, Rockhampton is a rural Queensland city that offers a wealth of fun and exciting places to visit. Boasting over 300 days of sunshine per year, Rockhampton is a city that incorporates coastal and rural life to provide a pleasant blend between the two and offering the perfect Queensland destination for any holiday. Set on 10 acres of tropically landscaped gardens, with nature trails and tranquil water features, you'll feel like you're in a rainforest when you stay at the Discovery Holiday Park in Rockhampton. Agnes Waters and 1770 are towns known for many things but perhaps none more so than for relaxation. Home to unspoilt beaches, untouched coral reefs and a serenity that is unsurpassed by any other Queensland town, 1770 and Agnes Waters cannot simply be passed through. 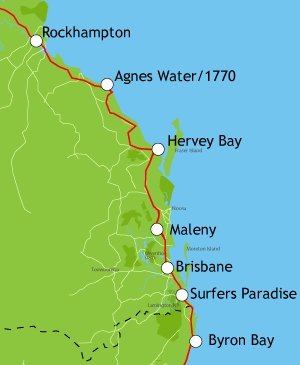 Named by Captain Cook in 1770, Hervey Bay is made up of numerous tiny townships, and is the gateway to Fraser Island. Considered one of the best places in the world to spot humpback whales, the area has numerous outdoor recreational opportunities, and a plethora of caravan parks. Step back in time as you explore the 19 buildings that make up the Hervey Bay Historical Village & Museum. Thousands of artefacts date back to the 1800s, and the site includes a church built in 1910, a railway station built in 1920, a slab cottage built in 1900, and a school built in the 1800s. Some of the buildings are fully furnished. On Sundays you can see a demonstration from a blacksmith and wood turner. This small settlement is tucked into a landscape of forested slopes and hills dotted with black-and-white Fresian cows. Maleny traces it timber-getting beginnings to around 1870, and its streets are named after various trees - including Maple, Myrtle and Cedar, in memory of those early days. The village is a local centre for craft activity and there are several specialist outlets with handcrafted jewellery, wood sculptures and hand-blown glass among the objects for sale. Situated just off Maleny-Montville Rd, Maleny Cheese is a must see for lovers of cheese. (www.malenycheese.com.au/)? Brisbane is the capital of Queensland and Australia's fastest growing city. Located on the Brisbane River, between the Great Dividing Mountain Range and Moreton Bay, Brisbane is a lush city with spectacular gardens and wonderful beaches. Brisbane offers visitors a wealth of sightseeing and dining opportunities, and you will need at least a full day to explore cultural and historical landmarks in Brisbane, and perhaps do some shopping at one of the outlet centers in and around the city. Queensland's Gold Coast is one of the most visited tourist attractions in the state. Home to the fabulous Surfers Paradise and the known destination for ultimate family fun, the Gold Coast boasts the country's best theme parks, including Dreamworld, Movieworld, Seaworld and Wet'n'Wild. The Gold Coast offers something for everyone, whether it is a romantic coastal escape or the family holiday of a lifetime. 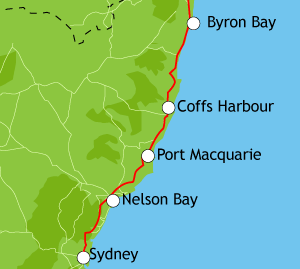 Byron Bay is one of New South Wales' premier tourist destinations. As a town relying solely on the tourism industry, Byron Bay certainly offers a lot, with superb beaches, a laid-back lifestyle, surrounding green hills and the rocky Cape Byron rising in the distance. Main Beach is a short walk from the town centre and is where all the action takes place. It is not unusual to see dolphins and their calves feeding not far from the shores or jumping through the breaking waves. Port Macquarie, at the mouth of the Hastings River, is a Mecca for water sports. The Hastings and Camden Haven Valleys are scenic wonderlands. Port Macquarie is rich in history, too. St. Thomas Church is one of the oldest in Australia. Life here is geared very much towards tourism. Experience things like boat hire, mini-golf, camel rides and scenic flights and also shops, cafès, restaurants and theme parks.